Unique Moments Photography from Gig Harbor Washington captured this image at Skansie Brothers Park and Net shed in downtown Gig Harbor. The historic Skansie House is located in the Park on Harborview Drive. The site will also act as a satellite Visitor Information Center. In honor of the town's rich maritime history, information on the Skansie Family adds to the overall experience of the visit. The entire downtown area is full of great photo locations for Engagement sessions, family sessions and High School Senior sessions. A short walk is the maritime pier by tides Restaurant and the beach areas to the entrance of the harbor. 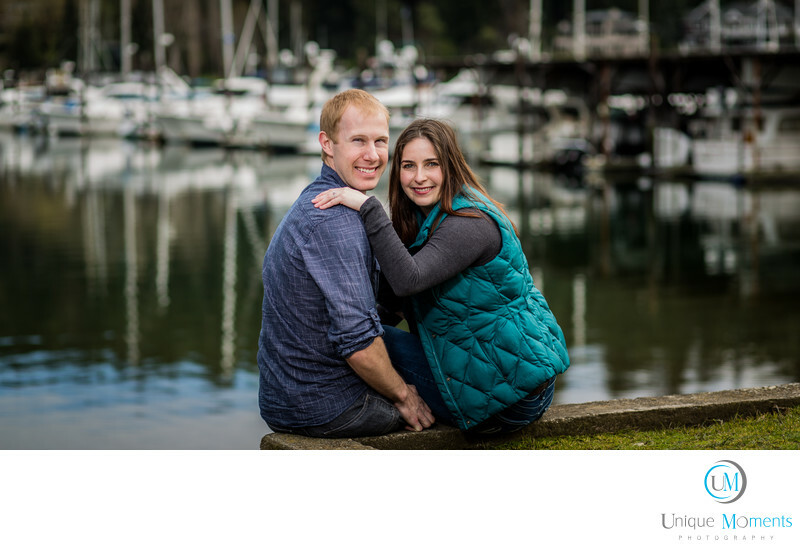 Our clients love to go to downtown gig harbor to capture images and then hang out for the day in one of Washington's best maritime cities. Remember, that when you select Unique Moments Photography, we provide a free engagement session for every wedding we photograph. Our clients wedding pictures look awesome and part of the reason images look so good is because we take our clients out before the wedding to get them familiar with the photo capture process. Let Unique moments Photography tell your wedding day story. Our clients complete satidfaction is our Number 1 goal. Location: 3211 Harborview Dr, Gig Harbor, WA 98335.